Atlanta Sharptech KAM-LOK Professional 27 Inch Market Hand Meat Saw with blade for precision custom cutting. Suitable for use in packing plants, meat markets, butcher shops, supermarkets. Pistol Grip Handle- Made of non-porous, virtually indestructible plastic that repels meat acids, stains, and bacteria. 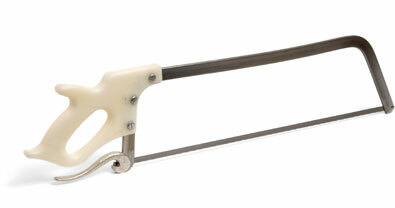 This hand saw is perfectly balanced and hand forged of rugged stainless steel. Precision alignment from grip to tip gives this saw smooth, clean, effortless and exacting cuts. The Kam-Lok Lever, located under the saw's handle is a flip lock lever makes changing saw blades fast and easy and always maintains the correct amount of blade tension. Square front.